Universal Basic Income: Is this a good idea for India? The idea to providing basic income to all who need it, is gaining momentum across the globe due to job losses, non availability of work, crop damage and due to other factors. Various political parties in India have also been making various commitments to provide universal basic income to the people. 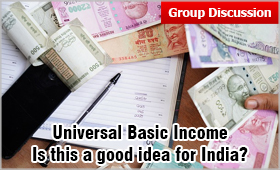 However, is the idea of Universal Basic Income across the sectors is relevant in India’s perspective has become a hot topic of debate and one of the key Group Discussion topics in MBA admission as well as other key important interview sessions. Several scholars and organizations around the globe, including Self Employed Women’s Association (SEWA), UNICEF have expressed strong support and have backed the implementation of UBI as an alternative to corrupt and ineffective existing social programs in India. On 1 February 2019, the interim Finance Minister of India, Piyush Goyal announced the 2019 Annual Budget which held a key point of a guaranteed income for farmers owning up to 2 hectares of land. All these farmers will get Rs 6000 annually in three instalments of Rs 2000 each. This initiative, has been put forward as a relief to the farmers but is also at the same time creating controversy regarding the minimal amount being offered. The changes are sure to be seen as the scheme is further executed and analysed. This step by the Indian government has suddenly shifted the focus to the idea of a universal basic income nationally. But the idea is still ambiguous and quite hard to implement in a diverse-income country like India. So, here we’ll discuss all there is to know about this and see it in an International context as well as how it will affect India if implemented. Universal basic income (UBI) is a Guaranteed Income Model (GIM) for providing all citizens of a region (village, state, country or Earth) with a definite sum of money, regardless of their income, resources or employment status. The purpose of UBI is to prevent or reduce poverty and increase equality among citizens. Guaranteed income model is an umbrella term used to define the methods designed to deliver funds to a given population. According to the advocacy group Basic Income Earth Network (BIEN), the essential principle behind UBI is the idea that all citizens are entitled to a liveable income, whether or not they contribute to production and despite the particular circumstances into which they are born. According to BIEN the income is to be periodic, in form of funds and not goods or services, individually for each citizen and not for households and irrespective of the citizen’s need or willingness to work. The two main types of GIM systems are UBI systems and Basic Income Guarantee (BIG) systems, however, a third model called Negative Income Tax (NIT) is also seen. Where, the first two concentrate on providing money directly to the targeted population, the third one is based on individual tax returns. All around the world, experiments are being done to see the effects of UBI. It has been successfully implemented in Namibia, Madhya Pradesh (India), Manitoba (Canada). There is also a similar program in Alaska, though with a different name than UBI. Some countries like Brazil and Finland have launched UBI Pilot Programs to monitor the success and implement it fully while many countries are in the planning phase of the UBI experiment. Other countries that have started experiments include Netherlands, Ontario, Uganda and Scotland. An American charity GiveDirectly started a UBI experiment in a village in Kenya with 22 USD to be given monthly to each of the 95 residents for 12 years. The program is further to be extended to 200 villages. The experiment has found that people use this money to better their lives by using it for business, paying children’s school fee and on other basic necessities like house repairs. The organization also indicates that it will investigate outcomes including economic status (income, assets, standard of living), time use (work, education, leisure, community involvement), risk-taking (migrating, starting businesses), gender relations (especially female empowerment and aspirations and outlook on life. Many countries have tried UBI and have found that while it provides some cash to every poor citizen, it does not really tackle the economy’s structural problems that keep people poor or generate vast inequalities. A 2016 referendum for introducing UBI in Switzerland was comprehensively rejected, with only 23% of Swiss citizens voting in favour. The White House’s chief economist Jason Furman had also dismissed the introduction of UBI in 2016 on the grounds that it could worsen inequality. However, this is why pilots and experiments are launched to see the effects on the population. With about 60% of Indian population indulged in agricultural work, and the farmer distress that has been common for quite some time now, the Government is now looking into ways to provide them with a minimum income that can at least guarantee that they could meet their daily needs. This is brought into consideration schemes like UBI for farmers or for all. The concept of UBI first came into limelight in India when Chief Economic Advisor, Dr Arvind Subramanian proposed it as a method of countering the poverty problem in the country. He dedicated a chapter to it in the Economic Survey 2016-17 which was presented in front of the Indian Parliament in early 2017. He even calculated the UBI for 2016-17 at Rs 7620 based on economist Suresh Tendulkar’s poverty line formula. The survey had estimated that such a model of UBI will cost 4.9% of India’s GDP in comparison to 5.2% of GDP spent on all 950 central sector and centrally sub-sponsored schemes. He also went on to propose a Quasi UBI (QUBI) targeting specific demographic groups like women citizens to tackle the problem instead of a nationwide UBI due to feasibility. UBI again came into spotlight in late December 2018 after the ruling party lost elections in Madhya Pradesh, Rajasthan, Chhattisgarh and Telangana states. The main reason for the loss being Congress’ promise to waive off farm loans as son as it came into power. While in Telangana the Rythu Bandhu Scheme offering direct fund transfers to farmers was implemented some time before the elections and it had paved way for the TRS to come into power, in the rest three states, loans were waived off after Congress won the elections. On 28 January 2019, Congress President Rahul Gandhi announced a minimum basic income for the poor if voted to power in the approaching General Elections 2019. This might lead to a possible scheme implementing UBI in some form or other by PM Narendra Modi too. Also, the BIEN Civic Forum will be held on the 22 August 2019. On this day, having been called “India Day”, two major plenary discussions will be held: one that focuses on the Indian state of Telangana and its policy initiatives related to basic income, and a second one about the more general debate at the Indian national level. The UBI solution might help alleviate poverty in India. According to the plan suggested in the Economic Survey 2016-17, the poverty could be brought down from 22% to 16% by implementing UBI. Moreover, those that cannot even afford basic necessities, might get a chance to do so. The fact that UBI needs to be unconditional for the target group will help them strive for a better standard of living with the security of a minimum pay guaranteed. If farmers were to be the beneficiaries of the proposed UBI scheme, the problem of farming debts may be alleviated a little along with the serious problem of farmer suicides all over the country getting some relief. The farmers can use their income either to benefit their farms or to invest in other things like a side business or necessities. With the security of a guaranteed basic income, people might not have to look for jobs that they are not wholly satisfied with. They can wait for the right opportunity and job to better contribute to the country’s as well as the organisation’s goals to the best of their ability. With the security of a guaranteed income at regular intervals, the labour class can invest in improving their skills to aim for better jobs in future. They can also invest in paying school fee for their children who in turn can also strive for a better living putting in play the ripple effect to grow the economy. Normally, it is seen that women suffer more than men at the hands of poverty. An income directly to their bank accounts would help them make a better stand in society as individuals. They can further invest in small business ventures that they deem beneficial. With an extra guaranteed income for people already earning, they can diverge into opening small businesses and further contribute to the Indian manufacturing sector. People can save up money over time and invest in schemes they deem beneficial for themselves and improve their standard of living. The main point of discussion when it comes welfare schemes is the fact that who will be paying the money ultimately. The Government pays the economically weaker sections with money that is paid in taxes. This is bound to cause discontent among those who pay taxes and see their hard-earned money being put to use in schemes that might not even reach the masses and benefit them personally. The income diversity in India is quite prominent and thus setting a price for the UBI is quite difficult. For some the amount offered might be a lot while for others it might be too low in comparison to what they already earn and not act as a supplicant to their advancement. A set amount paid by the government will inevitably lead to a decrease in the taxable income. This in turn will lead to a decrease in tax base for the government and eventually hamper welfare schemes with a shortage of funds at hand to invest in them. With the security of a guaranteed income, the availability of cheap labour might drop drastically. The people who needed to work for a living may not need to act as labour and thus, labour costs may increase. It was seen in the Rythu Bandhu Scheme that most of the farmers received amounts less than Rs 20000 while some received amounts greater than Rs 50000 which caused the scheme to encounter controversies. If such problems arose on a small-scale scheme, there are speculations as to what kind of fund leakages might take place when such a scheme is implemented on a nationwide scale.